ARRIS X-Speed 280 V2 is the upgrade version of X-Speed 280. ARRIS X-Speed 280 V2 with Eachine EV800 Goggle combo comes with ARRIS X-Speed 280 v2 RTF, ARRIS EV800 goggle. 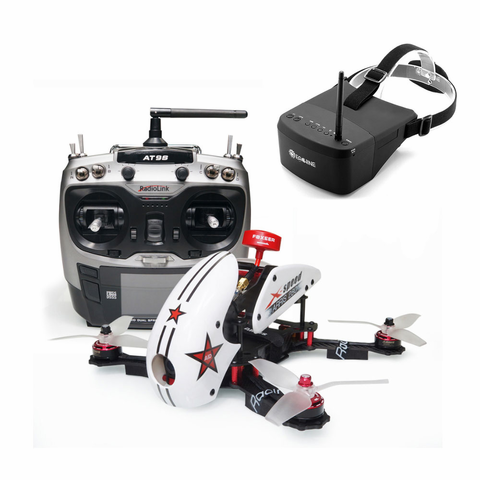 Plug the battery, click the search channel and pair the goggle with the robocat 280, you can start your FPV journey! For the canopy, the default canopy is white. Black, Orange and transparent is available here. 1. The two layers tower structure ESC is highly integrated design products,decreasing the interference caused by signal transmission. 2. The Tower structure design could protect the ESC well during the flight. 3. The tower makes the assembling of the fpv racing drones more and more convenient,the wires tidy and concise.The maintainance in the future is easy too, if you need to change it, the upper board of flight controller and lower board 4in1 ESC is sold separately. ARRIS S2205 2300KV brushless motor is the upgrade version of ARRIS 2205 2300KV motor.The motor is smooth and strong, it has high effiency and long working life. It adopts knul design, cooling systems, hollowed steel prop shaft and lowe center design, plus the high quality magnets and NSK bearing, the ARRIS S2205 will bring you amazing flying experience. The propeller on ARRIS X-Speed 280 V2 is 5042 3-blade propeller. The propeller is very powerful and well ballanced. It has 10% higher effeciency than normal propellers. Pefectly suitable for FPV racing. ARRIS FPV HD Ultralight 700TVL 2.8mm Lens Digital CCD Video Camera--This camera installed on all kinds of the fpv racing drones. The performance is super stable,and the picture from it is of high quality. ARRIS 5.8g 200mW 40-CH video TX with Foxeer antenna is pre-assembled. The ARRIS TS5823S transmitter packs 200mW of ultra clean 5.8GHz power in a micro sized video/audio transmitter! A must for those looking save size and weight while still getting good performance.With the Foxeer antenna, you can get longer range. ARRIS X-Speed 280 V2 has integrated with a remote controller battery warning buzzer, pilot can set the threshold (adjustable) according to CF parameter-adjustment software. In addition, you can also locate your racing drone through triggering the buzzer with the switch D on the transmitter. Self-level mode is the easiest to fly, because when you leave the stick at the centre and not controlling it, your drone just level itself and stays there. But when you are familiar, you will like to fly in Acro Mode (Manual Mode). Manual mode is useful for acrobatics such as flips or rolls, or FPV when smooth and fast control is desired. The picture below is what we set on Radiolink AT9 Radio.